Way Out Ware presents the one and only ARP 2600 emulation endorsed by the original ARP 2600 inventor! For nearly 4 decades, the ARP 2600 has helped to provide the backbone for electronic, urban, and popular music. Today, musicians and producers aggressively pursue the limited number of remaining ARP 2600 synthesizers for their distinctive warmth and unmatched fidelity. The TimewARP 2600 delivers the same fat sound with twice the flexibility; at a fraction of the price of the original. This is one synth that you can't afford to be without. By developing their own proprietary and optimized virtual analog oscillators and filters, WOW brings the most accurate digital reproduction of the 2600's fat analog sound to your desktop. All of the original control features from the ARP 2600 are there, and because you can now save your carefully programmed patches, the TimewARP 2600 is even better than the real thing! The ARP 2600 synthesizer helped define the music of an era. Edgar Winter's "Frankenstein," The Who's "Who Are You," The Tubes, Jean Michel Jarre, Deep Purple, and on and on. Only 3,000 ARP 2600's were produced between 1970 and 1981, and they've been trading hands among collectors for thousands of dollars ever since. The success of any great analog synthesizer emulation relies on accurately modeling the behavior of the Voltage Controlled Filter module. Not a trivial task, WOW has created a new industry benchmark with its TimewARP 2600 digital VCF. It must be heard to be believed. There is no limit to the number of patches you can create and save with the TimewARP 2600. In addition to comprehensive import and export abilities, we also include a sophisticated Patch Manager for sorting your presets any way you want. The TimewARP 2600 also responds to MIDI bank-select and patch-select commands for total control. Utilize the signal input/output function on any ProTools I/O bridge to use the TimewARP 2600 like an elaborate signal effects processor. Plug in a guitar, microphone or other sound source to provide an additional signal feed to be used in the TimewARP as an oscillator, LFO modulator, control voltage and more. Use the synthesizer as an effect to process the input. Create one-of-a-kind vocoder effects. For example, Pete Townsend used this ability to drive the guitar sound in The Who's "Who Are You." Running as a track plug-in, the TimewARP 2600 can also process prerecorded MIDI tracks. Under MIDI control, the Internal Clock may be synchronized to an incoming MIDI Beat Clock. 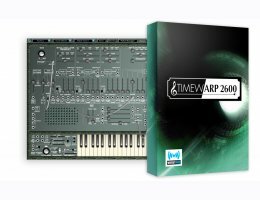 The TimewARP 2600 comes loaded with hundreds of great patches right out of the box, and due to the TimewARP's unique sonic environment, you can create "evolving textural patches." The original ARP 2600 was a monophonic instrument. But those days are over. Sure you can play the TimewARP 2600 in monophonic mode, but you'll have more fun playing all of those classic patches with multiple voices for the first time.